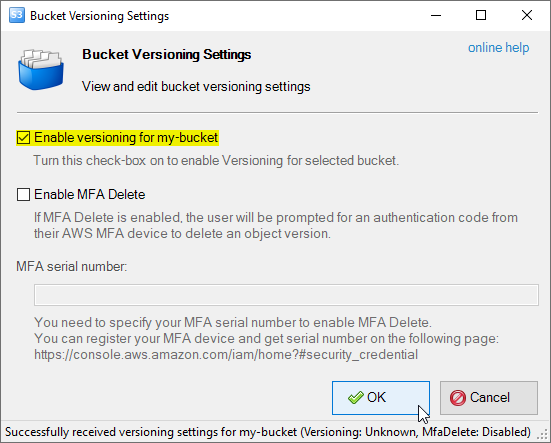 Working with Amazon S3 Versioning: Enable Versioning for Amazon S3 Bucket, Restore Deleted File on Amazon S3, Manage Object Versions. Amazon S3 Versioning. Amazon S3 Version Control. Enable Versioning for S3 Bucket. Restore Deleted File. Versioning allows you to preserve, retrieve, and restore every version of every file in an Amazon S3 bucket. 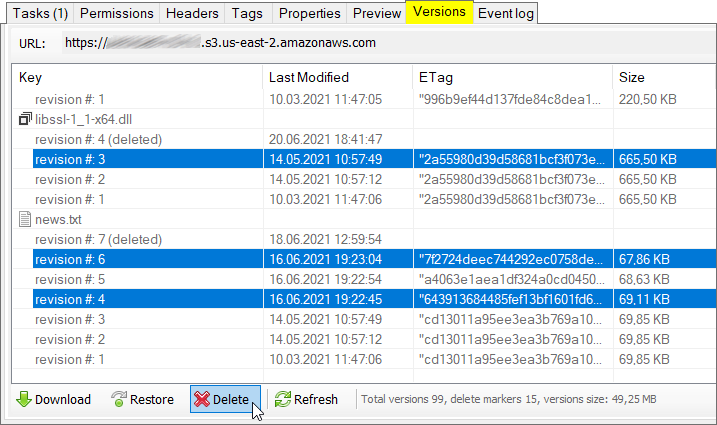 Once you enable Versioning for a bucket, Amazon S3 preserves existing files anytime you overwrite or delete them. Since version 3.5.5 S3 Browser Freeware supports Amazon S3 Versioning and provides you an easy way to work with versioning and manage file versions: enable or disable versioning for an s3 bucket, view all versions and restore deleted or overwritten files, download any version to your computer or completely delete file version(s). Click Buckets -> Edit Versioning Settings. You can also use Ctrl+Shift+V shortcut key. Bucket Versioning Settings Dialog will open. 2. 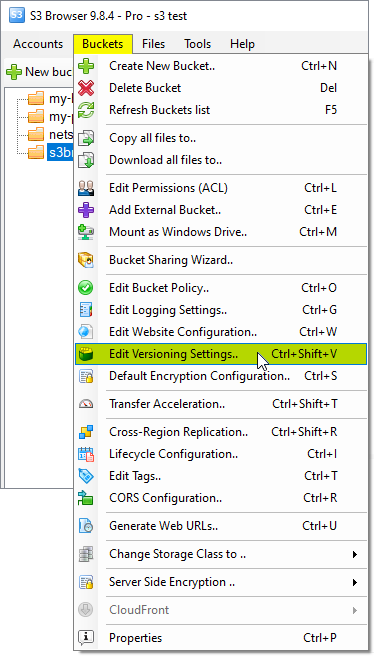 Enable or disable versioning for the bucket using corresponding check-box. An MFA Delete feature adds an extra layer of security to your versioned buckets. To enable MFA Delete you need to specify MFA serial number. 2. Check Enable MFA Delete and enter MFA serial number and click OK.
Navigate to the file that you want to view versions of and open the Versions tab. All versions of a file are available on the Versions tab. Select the version you want to restore and click the Restore button. Deleted files are not displayed in the Files list. 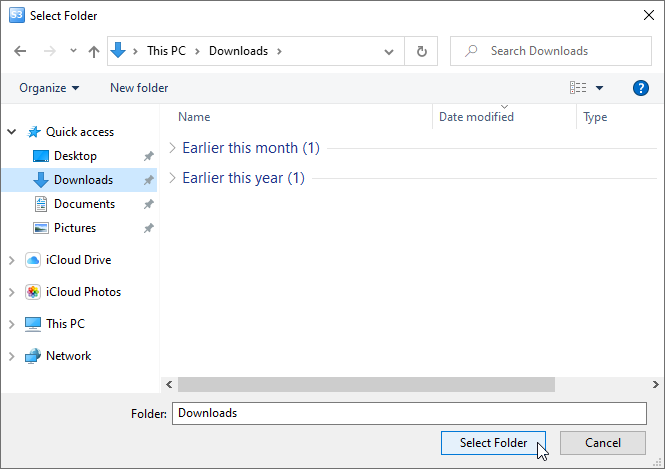 To view deleted files, you need to select the parent folder or a bucket. S3 Browser will show all files and versions in the folder or in the bucket. Deleted files displayed in gray. A list of deleted files and all their versions. Naviate to the parent folder (or the bucket). Open the Versions tab and find deleted file in the list (see picture above). Select the most recent version and click the Restore button. Select the most recent version of the file and click Restore. Note: The latest revision of a deleted file is a delete marker. 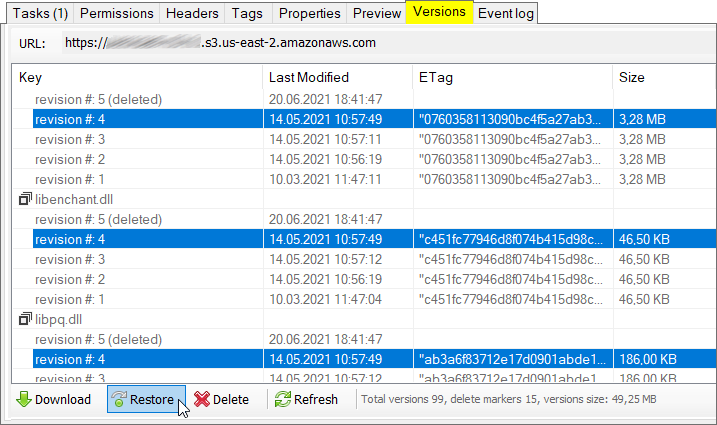 A delete marker is used by Amazon S3 to mark the file as deleted. It does not have data associated with it. So, you need to choose the previous revision when you are restoring deleted file. 1. Navigate to the file and open the Versions tab. 2. Select the versions you want to download and click the Download button. Select destination folder on your computer and click OK.
You can track download progress on the Tasks tab. 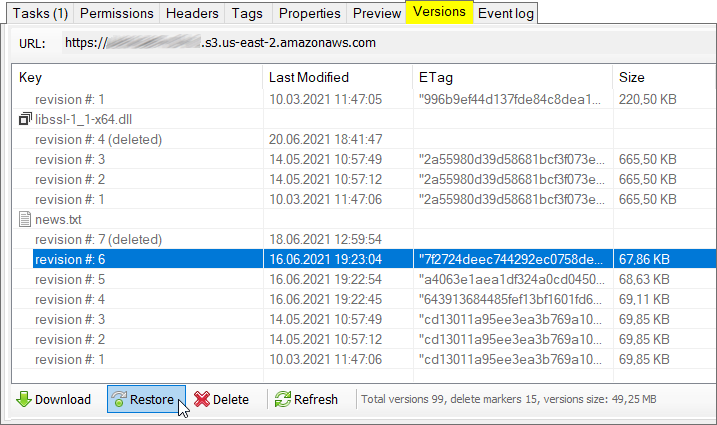 File versions archived to Amazon Glacier (i.e. versions with GLACIER storage class) are not available immediately. 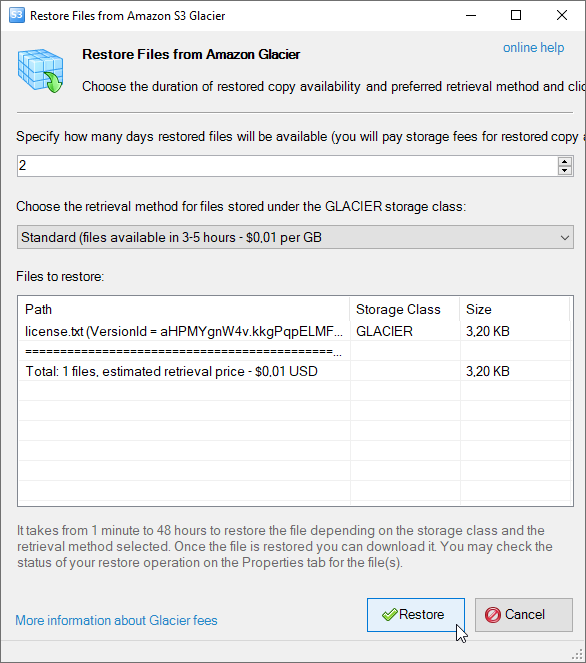 To get access to these versions you need to request them from Amazon Glacier storage first. Below you will find detailed instructions. 1. Select the file and open the Versions tab (or select the bucket or a folder to restore versions of multiple files). 2. 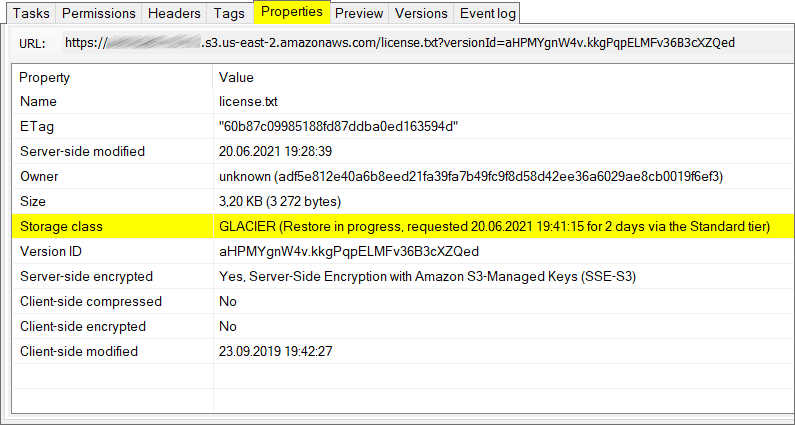 Right-click on the version(s) you want to restore from Amazon Glacier and choose Restore from Amazon Glacier..
Right-click the versions you want to restore and choose Restore from Amazon Glacier..
2. Specify how long restored files will be available for download. When restore operation completed, you can make restored version current (use the Restore button) or download it to your local disk. The Storage Class row shows current storage class and the status of restore operation. If version is not ready, you will see the Restoration in progress message. When version is ready you will see the Restored until [DATE] message. 1. Select the file and open the Versions tab. 2. Select the versions you want to delete and click the Delete button. Select versions and click the Delete button. Confirm versions deletion. There is no way to restore deleted versions. 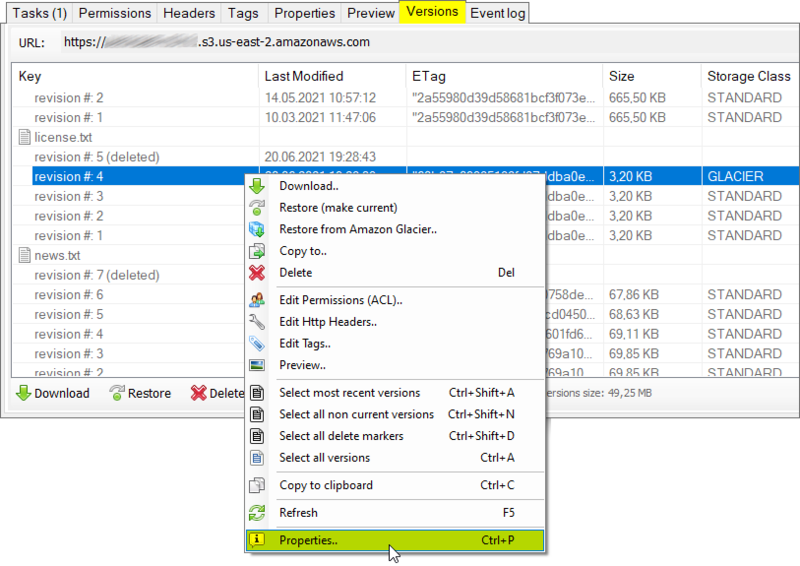 New version of S3 Browser allows you to restore file versions in bulk mode. You can now restore all files in a bucket or folder, for example if they were accidently deleted. 1. Start S3 Browser and select the bucket (and optionally the folder) that you want to work with. 2. Open the Versioning tab. Right-click and choose Select most recent versions. 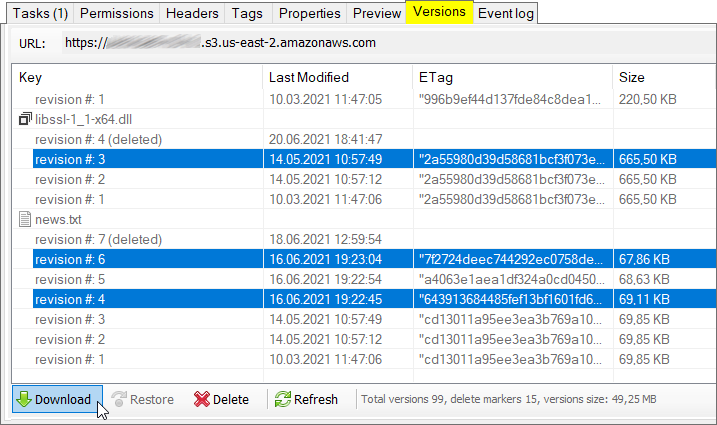 S3 Browser version 4.4.5 extends support for Amazon S3 versioning allowing you to view and edit version permissions and generate web urls, view and edit version headers, preview file versions, view version properties. See detailed instructions below. Right-click the version and choose Edit Permissions (ACL).. Here you can edit version' permissions and/or copy version web URL. See the detailed manual for permissions editor here. Right-click the version and choose Edit Http Headers.. Here you can edit version headers, such as Content-Type, Expiration, etc. Right-click the version and choose Preview.. 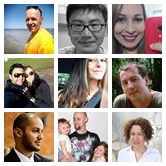 Here you can preview some types of files, supported formats are: plain text, image, binary. Right-click the version and choose Properties.. Here you can view extended version properties: ETag, Key, Last Modified date, Owner information, Size, Storage Class, Encryption status and version Id. You can also copy selected fields to clipboard (see the context menu).